Not sure where to start with wedding table styling? 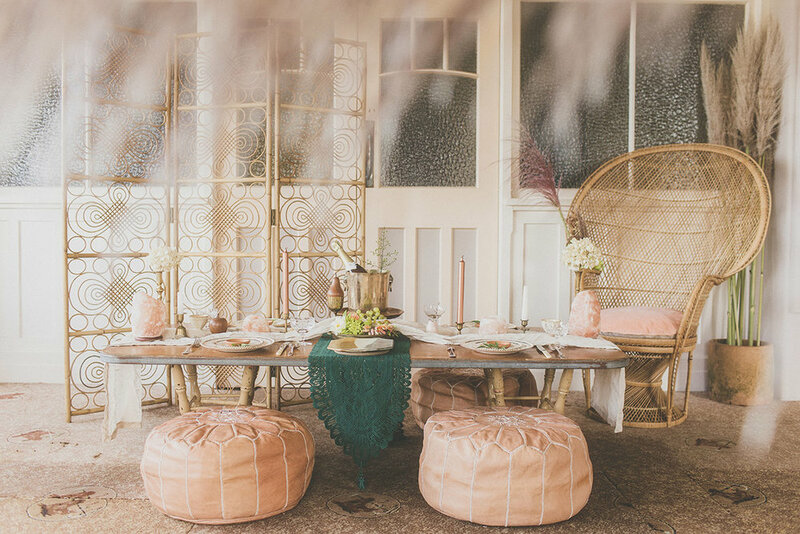 With a massive thanks to Summer from The Vintage Party for sharing her expertise, and this stunning styled shoot she organised, here are a few thoughts to guide & inspire you. Let’s get into it! The first thing you’ll want to decide is the mood or feel of your table. Take your cue from the surroundings. Whether it’s going to be a garden setting, church hall, industrial space or formal dining lounge, the style of the table should sit comfortably within the setting. Decide your key elements – is there something bright, bold or just plain unusual that you want to stand out on your tables as a talking point? Maybe you have shiny gold charger plates or bold florals, or something that you’ve sourced or made specifically that you want to be in the limelight. Let this element determine your colour palette. Try to keep the remaining elements understated – they’ll play a supporting role and should blend in, quietly aligning with your key pieces in terms of their colour and tone. Symmetry is a major factor in table styling. The level to which you take the symmetry will be determined by how formal you want the end result to be. For a more relaxed table, relax the symmetry. At the very least though, there should be (at least two) evenly spaced ‘anchor’ points to create order, guide the eyes and promote a sense of visual calm, rather than chaos. It’s also important not to over-crowd the table – remember to leave some good old visual space here and there – sometimes less will be more. Once you have your key feature and colour palette sorted, it’s a matter of balancing the rest of the supporting elements. They will all have a certain colour, shape, height, texture and finish. Pay close attention to these and mix them up to create subtle contrasts and make it visually interesting. For example, loosely-tied linen napkins bring a contrasting softness to the hard plate surfaces. Naturally-formed details (such as florals, sea shells, driftwood etc) all bring their own organic texture and ease that offsets the more rigid surfaces and lines of cutlery, metal and glassware. Candlesticks are brilliant for drawing the eye up and away from the table surface itself, effectively framing the mid-level elements. Have fun and think outside the box in terms of things that you can use to decorate your tables. Experiment, and trust your eyes. Sometimes the things you think will look perfect just don’t work – if this happens, go back to your key elements and build from there. And when it all gets too confusing, step away, do something else and come back with a fresh outlook!